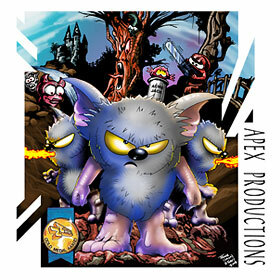 The classic game CREATURES by Apex Computer Productions is now available as a budget disk release - brought to you in 2009 by Psytronik Software in association with www.infinitelives.tv. This budget C64 disk edition of Creatures is presented in a full colour glossy sleeve featuring brand-new artwork desiged by Trevor 'Smila' Storey The game also features a full colour disk label and comes with a glossy instruction sheet. Held in devilish torture chambers, an entire village of Fuzzy Wuzzies - the cutest but most mischievious characters ever - need your help! Control the only free Fuzzy, Clyde Radcliffe, on a mission that takes him through the haunted Black Forest of Gateau, to a land full of crazy creatures, scuba diving in piranha ponds and into the lethal torture chambers themselves! You need quick reactions, a sharp brain and a crazy sense of humour to complete the cartoon game of the year - Creatures! · Brand New Disk-Sleeve Artwork! · Includes Playable Demos Of Mayhem in Monsterland + Creatures 2! · Premium Edition Includes Free Soundtrack CD! · Zzap!64 Gold Medal Winner! This game is dedicated to Mr & Mrs Rowlands without whose help it would not have been possible.